Please note that the content of this book primarily consists of articles available from Wikipedia or other free sources online. 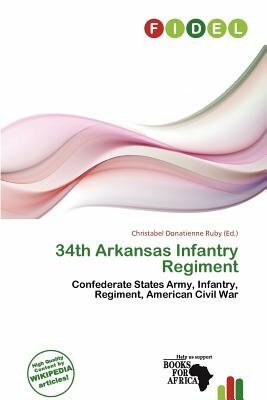 The 34th Arkansas Infantry (1862-1865) was a Confederate Army infantry regiment during the American Civil War. The regiment was originally designated by the state military board as the 2nd Regiment, Northwest Division, District of Arkansas. Immediately following the Battle of Pea Ridge, General P. G. T. Beauregard, acting for General Albert S. Johnston, ordered General Earl Van Dorn to bring his Army of the West to Corinth, Mississippi, to join Johnston's force for an attack on the Union Army at Shiloh, Tennessee. Additionally General Van Dorn moved all supplies he could, including the machinery and stores at the Little Rock Arsenal, to northern Mississippi with him, and left few men behind. However, due to bad roads Van Dorn failed to reach Corinth until a week after the Battle of Shiloh.